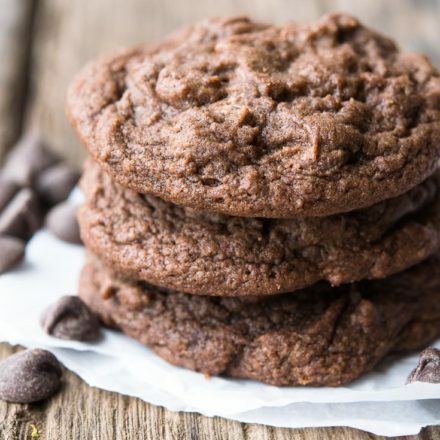 Chocolate Chocolate Chip Cookies deliver double chocolate flavor in this moist & decadent twist on the classic cookie! It’s chocolate heaven in every bite! Chocolate Chocolate Chip Cookies give you a double hit of chocolate compared to traditional chocolate chip cookies. 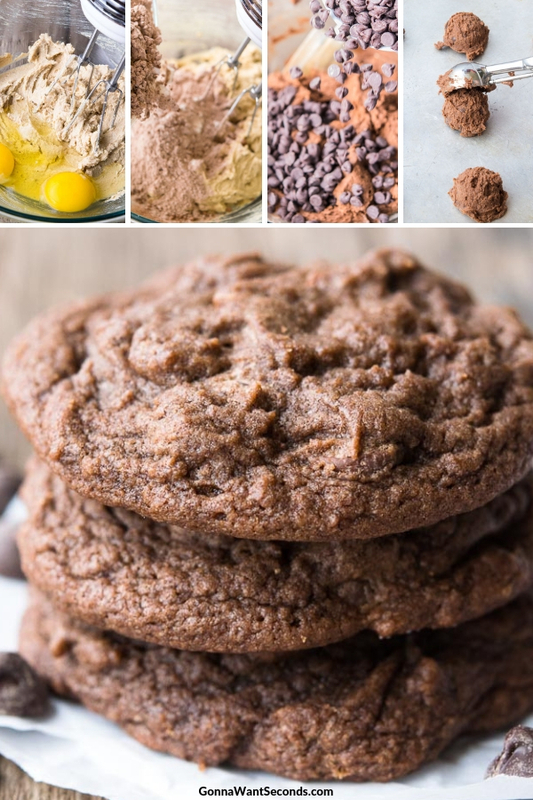 With all that chocolatey goodness and a few other twists, our ultimate Chocolate Chocolate Chip Cookies recipe is off the charts decadent! I always thought that straight chocolate chip cookies were the pinnacle of cookie heaven- until I tried these babies. It’s easy to go to the dark side with these too, tips to the rescue! 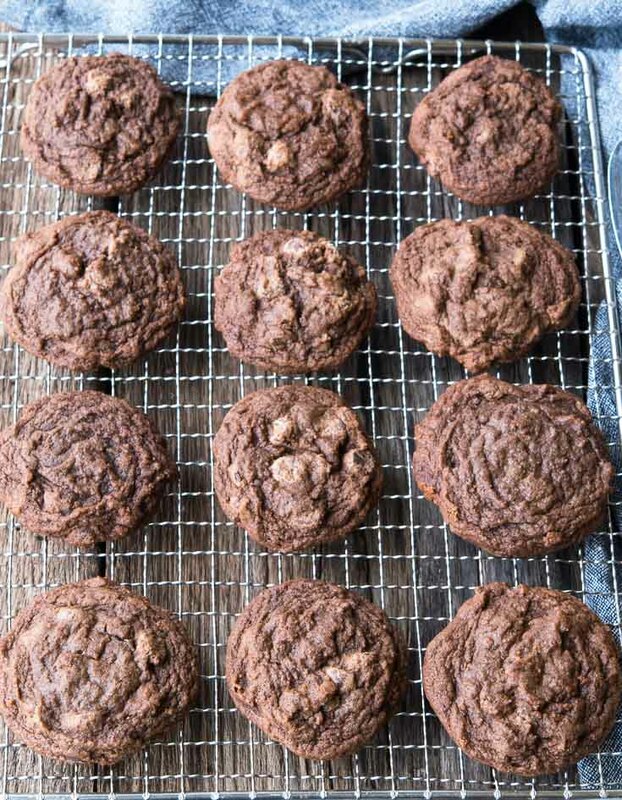 Use your favorite dark chocolate to create dark chocolate chocolate chip cookies. You can skip dropping individual cookies by using this versatile recipe to make Chocolate Chocolate Chip Cookie bars. Bars don’t have to be boring! In the chocolate chocolate chip cookies Martha Stewart makes, a skillet replaces the traditional rectangle for a fun variation. Round or square, these cookies will always be delicious! Double Chocolate Chip Cookies = double the indulgence. They’re super moist, and chewy. You can never have too much chocolate- right? What Are Chocolate Chip Cookies? They’re thick, moist, and chewy cookie heaven! Chocolate Chips are added to the cookie batter – which takes the humble cookie to a whole new level! My take on the classic ticks all the boxes for my vision of the perfect Chocolate Chip Cookies. Chocolate chip cookies history reveals that this beloved treat originated in the late 1930s when Ruth Wakefield, the proprietor and chef of the Toll House Restaurant, developed it as a twist on the butterscotch cookie. 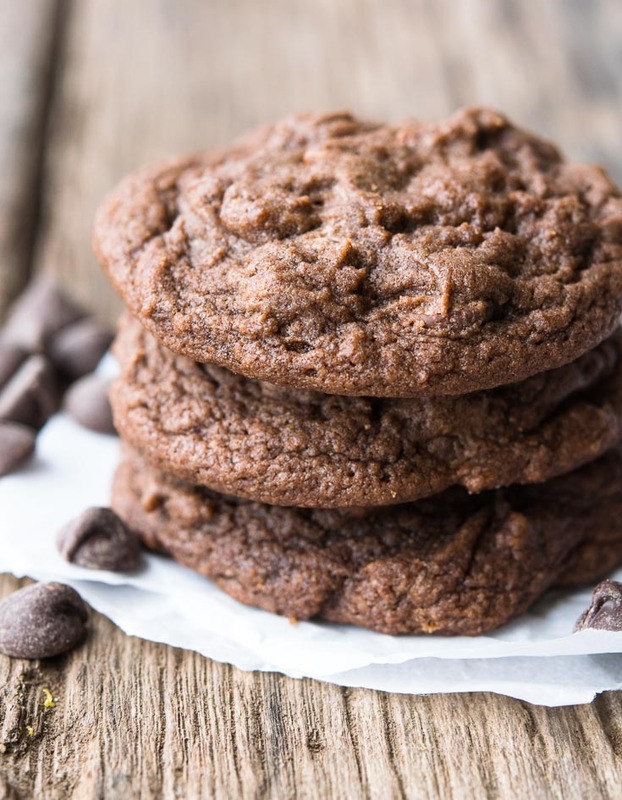 A true piece of Americana, there are lots of fun facts about chocolate chip cookies, including over 7 billion of these treats are consumed annually in the U.S. alone! What Ingredients Do You Need To Make Chocolate Cookies? The ingredients for Chocolate Cookies are the same as chocolate chocolate chip cookies. You’ll need butter, brown and granulated sugar, eggs, flour, vanilla, salt, and baking soda, cocoa powder, and semi sweet chocolate chips. Chocolate chip cookies nutrition will be similar to this recipe… but let’s not worry too much about that! These cookies are far too good to quibble over calories! How Do You Make Chocolate Chocolate Chip Cookies? Learning how to make chocolate chip cookies couldn’t be easier! The ingredients for chocolate chip cookies are usually in your pantry. To make them, mix all the dry ingredients. In a separate bowl, cream together butter, brown and granulated sugar, vanilla, and eggs. Then combine the flour and butter mixture. Mix in chocolate chips. Drop by spoonfuls on a cookie sheet and bake! 1. Preheat oven to 375° F. Line baking sheets with parchment paper or silicon baking mats. Set aside. In a bowl, mix all the dry ingredients. In a large mixing bowl, cream together butter, brown sugar, granulated sugar, and vanilla. 2. Add eggs and beat until light and fluffy. 3. Gradually add in flour mixture. Mix until just well combined. 5. Using a small cookie scoop, scoop out balls of dough on prepared baking sheets. 6. Bake until the center of cookies no longer look wet. Then cool completely on wire baking racks. Preheat oven to 375° degrees. Line baking sheets with parchment paper or silicone baking mats. Set aside. In a small bowl, whisk together flour, cocoa, baking soda, and salt. In a large mixing bowl cream together butter, brown sugar, granulated sugar, and vanilla until well combined. Add eggs and beat for 2 minutes, or until the mixture is light and fluffy. Gradually add in flour mixture and mix just until combined. Stir in chocolate chips. Using a small cookie scoop, scoop out balls of dough and place on prepared baking sheets. Bake in preheated oven, just until centers of cookies no longer look wet, about 8 minutes. Cool on baking sheets 5 minutes then remove and cool completely on wire baking racks. Chill the dough – Put it in the fridge overnight if you can but even an hour or two ahead of time will help. Use butter – The flavor of butter is the boss in baking. While margarine will create a thicker, softer cookie. Use enough flour – Every batch of cookies is slightly different. You want just enough flour to make the dough start to pull away from the sides of the mixing bowl. As you’re getting close to the right consistency, check it a spoonful at a time to get it just right. Hot pans – Make sure your cookie sheet is cool before you spoon your cookies onto it. If it’s warm, the cookie will start to cook and melt before it goes in the oven. The Butter Dilemma – When choosing salted or unsalted butter for chocolate chip cookies, you will find supporting evidence for both sides. Salted butter has a higher moisture content that can affect the texture and rise of your cookies, but some bakers swear by it. I typically use unsalted, but either will work. If you’re using salted, decrease the salt by ¼ tsp. Baking – The last crucial component in how to bake chocolate chip cookies is the time in the oven. The longer they cook, the crispier cookies get. Watch for the edges to get brown and scattered browning on top. Can You Make Alton Brown Chocolate Chip Cookies Ahead Of Time? Yes, you can and of course Alton Brown has cookie making down to a science! Alton Brown Chocolate Chip Cookies variations range from the Thin to the Chewy. My vote is for Chewy any day! You can make this (most) chocolate chocolate chip cookie recipe several days ahead of time. The dough holds well in the fridge for about three or four days. Since they store so nicely, there’s no need to make a small batch of chocolate chip cookies. Skip the half batch chocolate chip cookies, and you can indulge in fresh from the oven cookies for days! The simple step of browning butter has an amazing impact on the taste and texture of your cookies! I swear Brown Butter Chocolate Chip Cookies are a magical transformation of the classic! I get often get asked- “Can you freeze chocolate chip cookies?” The answer is an emphatic- YES! And the best part is, you can choose to freeze the dough or the baked cookies! For baked cookies – simply place cooled cookies in a freezer bag when cool and pop them in the deep freeze. They’ll stay fresh for several months. 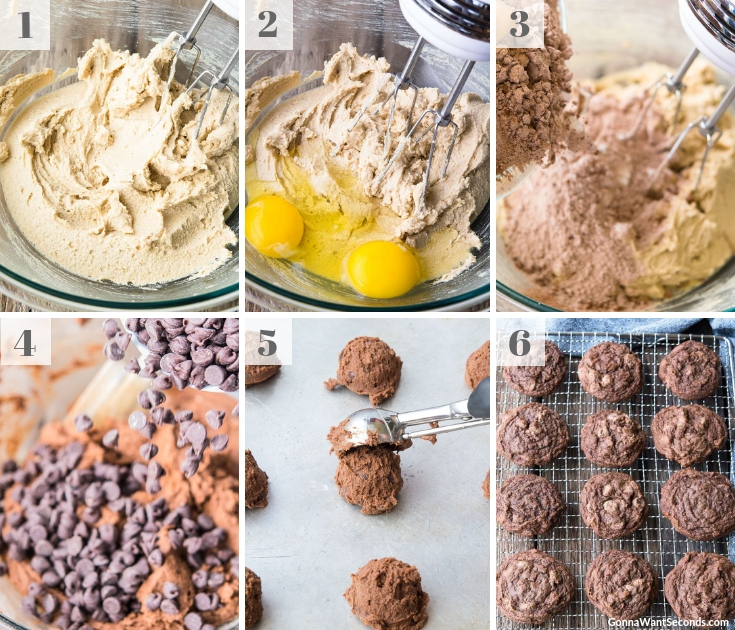 For the dough – It’s best to freeze individual cookies dough balls. Drop spoonfuls on a baking sheet lined with parchment paper or a silicone mat. Freeze for about an hour. Place the frozen dough balls in a freezer bag. The dough will hold for 4-6 months. Crisp, soft and chewy, or sandwich style, these delicious chocolatey treats are perfect with a cold glass of milk or a hot cup of coffee! The addition of oatmeal takes a regular chocolate chip cookie and adds layers of moist texture. 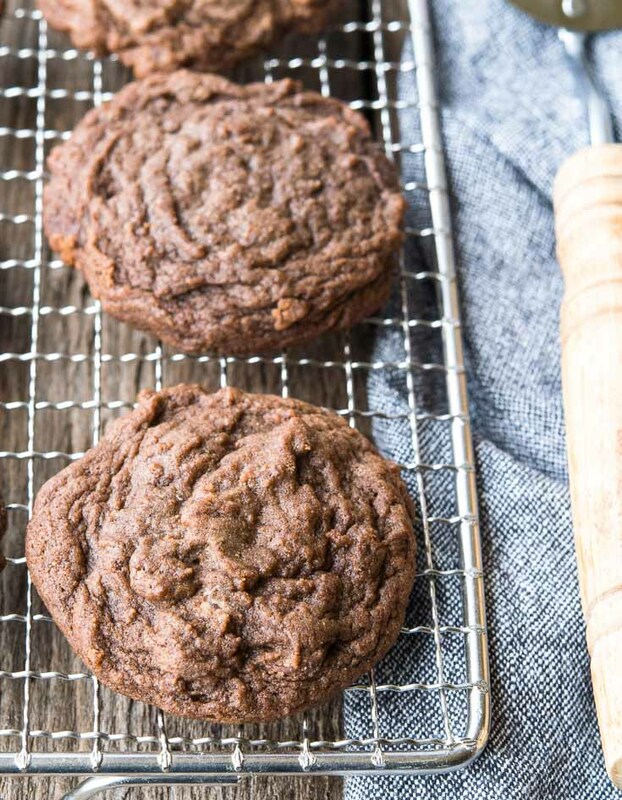 Best of all, Oatmeal Chocolate Chip Cookies stay moist and chewy for days! I don’t think you can beat the peanut butter and chocolate combination! Peanut Butter Chocolate Chip Cookies marry my moist and chewy peanut butter cookie with a generous amount of chocolate chips for sheer cookie perfection! This simple twist on the classic creates a wonderful new taste. White chocolate chip cookies can be made with straight white chips or with a mixture of flavors like the chocolate chocolate chip cookies Pioneer Woman makes. Bursting with chocolate chips in every bite, chocolate chip meringue cookies are like little clouds of deliciousness! The recipe I printed yesterday has 4 cups of chocolate chips, melt 2 cups; I went back because not all of #3 instruction printed and now it is gone. I was wondering do I do my butters and sugars then add the melted chocolate, etc before doing the flour as the last step? I guess Nestle must of gotten upset. Hi Marty! The recipe should always be available online and ready for you to print. I can’t imagine what happened? it would be nice to be able to print this recipe but the site does not show a place for printing!!!!! There is a green print button just under the article title and another one directly on the recipe, on the left-hand side, below the little square picture. 🙂 Hope that helps.